In February the Neuer lab left the desert behind and went to the annual ocean sciences meeting (ASLO) in Honolulu. All of the graduate students presented on their research and Logan Monks (one of the undergrads working in the lab) also presented a poster. These meetings are a great way for students to gain new insight into many other projects that are going on around the world. 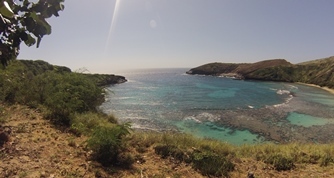 The meeting was busy and informative and a great way to meet and mingle with other marine scientists, but we also found some time to see the ocean and experience a coral reef at Hanauma Bay which is established as a nature preserve in Hawaii. This year the Neuer lab contributed to the conference by presenting three posters and one talk. Wei Deng and Logan Monks presented posters on aggregation of Synechococcus and sinking characteristics with additions of different types of clays. Francesca De Martini had a poster looking at the growth and grazing rate of pico and nano phytoplankton community and its link to the carbon export in the Sargasso Sea. Kyle Kinzler presented his findings from research looking at diatoms and other organisms that reside in the land fast sea ice based in the Arctic Ocean.